Tia has always been a precarious dichotomy of order and chaos between humans and vampires. In recent months, tides have shifted from human rule over to vampire. The former humanoid ruler, Nica Sero, has been taken prisoner by vampires of the Dolos and Matton families. These relatives of the former Viscount of Tia now claim rule over the empire. Suspicion in Sero’s ways keeps even humans from questioning why he was deposed. The kingdom has fallen to warring malaise its wake, deprived of its illusory peace and determined to place the blame on somebody’s shoulders. Tia was built on a point of convergence between rivers, creeks, and glens; sodden ground at the surface, but finds stability deep in Valucre’s crust. Pipelines and mining floors reach from there into the mantle in order to harness its heat and fossil fuels as energy. These steel behemoths of Tian industry are draped with brambled foliage and shredded fabric. Ground level Tia resides atop one slab of granite and one of steel. Five pumping rigs larger than any on the face of the planet dot the city with enclosed and guarded vents and shafts that access their underground mines. It is neither known how far down the mines stretch, nor what goes on beneath the -5th story (Classified). Stretching kilometers into the sky beside these monoliths are the many newly sprouting corporate offices and residential towers. Palgard: South: ~400 miles. The distance is staggering on foot, manageable on horse. Having begun as a black mark between Moonwood and the Haunted Glen, Tia stands a story of redemption and failure. Its roots lie in the darkness of the Desecrater era long past and stem through an uncertain age ruled by primal, warring creatures under the thumb Northern vampiric rule. After ages of tumult, a calm overshadowed the city so that it enjoyed the juicy fruit of industry, recreation, diverse social acceptance, and enlightenment. The idea that the city was a safe place under the Sero regime has aged poorly. Humans lost trust in regent Nica Sero in light of news that he had been facilitating human trafficking with vampire nobles in order to maintain his own rule. The insidious ruler had been using blood magic to lure his victims into the city’s shadows, utterly decimating the humanitarian image he had fostered during the campaign that won him control over Tia. Nica Sero was a nefarious circuit of mysteries that neither vampires nor humans saw fit to rule any longer, but his experience dealing with the city’s complexities made him valuable. For this reason, Dolos vampire rulers did see fit to keep him prisoner and advisor, a palorous representative of palorous human interests in Tia. 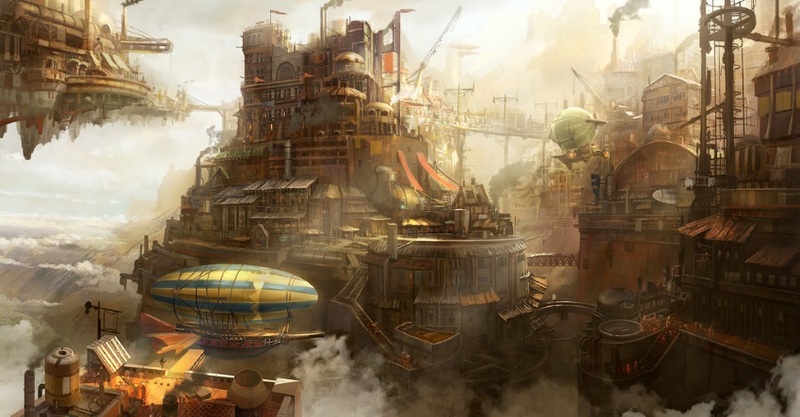 Copper City demands redemption from its old, but new and demonic tyrants. Tia is humid! Snow does not fall in the winter, but instead a most pleasantly rainy atmosphere surrounds the city. The summer heat has its citizens loosening ties and unbuttoning buttons. Spring and fall carry a variance between the cool winters and the warm summers, commonly rain, and a highly dense fog. The muggy air feels still these days, stagnant with death and fear. The vast majority of Tian vegetation lies on the outskirts of the main city, where the expected spectrum of life thrives in a sufficient expanse of forestry and farmland capable of supporting such a metropolis. There wander into town a multitude mysterious creatures, however, due to its proximity to the Black Hills, the Haunted Glen, Moonwood, and the Lake. The number of incoming abnormalities are bolstered by vampire rule. Body snatchers: Nasty and hive-minded, these alien buggers were awakened by expeditioners in Ponkapoag Lake and are known to take over minds. Ghouls: With the increase in vampire presence and an open acceptance of their power, much of the human population who refused to leave has been converted to slack jawed ghouls. These zombie-like demis are created when a Dolos or Matton vampire sires an impure human (ie: a human who has lost their virginity) and will attack anything that has yet to be sired. Drawn from the many very different surrounding areas Tia’s population began about as diverse as it comes, and not necessarily peacefully. As time went on and many factions warred for power both over and under the table all beneath the shifty rule of vampires with heavy thumbs, someone meticulously planned the bringing together of all its people. Vampires were overthrown, then the next party, to make way for a politically sound gathering which, combined with spiritual techniques from across the face of Terrenus and a merciless militarization of law enforcement, brought Tia’s diverse wealth together as one. Clans who saw fit to victimize others were crushed or employed by a less niandrotholic, more business-oriented corporation run by city government. At least, this was the facade maintained by the last government. Under the layer of ignorant joy settled over much of the population frothed discontent. Vampires were cast as evildoers on the surface world, even though they had just led a largely peaceful rule over humans. The propaganda that unseated them was written by human hands that were bloody with its own kind: Nica’s officients selling children and women to underground blood banks to sate vampires who would otherwise rise up. When vampires realized they could prosper just as well without the support of the human regime, they rose up. Led by the Dolos first and second the Mattons, now Tia is a vampire haven imbibed with pockets of powerful human resistance. While many humans are victim to the attacks, a sect of them called the Rooks carries blessed ammunition with which to dispose of the vampire threat called X. Caliber. For what could be referred to as somewhat of a golden age of industry, Tia had established itself as a Terran powerhouse of steel and steam to be reckoned with. That was before commute became a matter of risking one’s life. Before a sword maker had to worry he might be stabbed with his own product. Now the steel behemoths of Tian industry are draped with brambled foliage and shredded fabric that blows in the ghostly breeze. Fauxton: Synthetic protons attach to and break down matter, then are shot from one Fauxton receiver to another at near light speed using line of sight. Living beings can be transmitted through the Fauxton, but will experience almost debilitating discombobulation. Thanks to the Fauxton being indigenous to Tia, most businesses in the city have unlimited access to their own Fauxton receivers. Because of this, shipping any business materials is easiest inside of Tia. Fauxton rentals are available from most city vetted Tian companies for a reasonable price. Barry’s Bears and Toys for Girls and Boys: A toy factory that toils day in and day out to produce an enormous stock of children's toys and products from hairbrushes, cradles and onesies to action figures, dolls, bicycles and squirt guns. Boarded up: Barry has fled to Aspyn in search of refuge from war. Full Deck Dock: The Full Deck is an extravagant Casino Boat that docks in Casper, Last Chance, and Tia. The Full Deck is presently out of commission, its dock deemed unsafe for human purposes. Gardens Inc.: A clandestine gathering of gnomes who are able to cloak themselves from visibility and deal heavily addictive brain drugs that inflict nasty withdrawals and have led to deaths. This business has experienced a booming in underground illegal activity with the fall of the Sero regime. Girdy’s Girders: A massive steel mill that produces the majority of Tian steel and steam products. Customer demographic includes the outlying villages of Tia and contracts thrive with multiple industries and transportation corporations across Terrenus. Girdy has been taken prisoner, half of her profits given to the Dolos family in order to increase its wealth and tighten its hold on the crippled Tian industry. Highway Wicked Gang: Biker gang composed mostly of vampires who keep some very poorly educated trolls (called the Trolls of Doom 'n Gloomy) as servants in an outpost on a pathway from Tia to Ponkapoag Lake. Now the chugging of their motor vehicles fills the outskirts of Tia as they rove the streets and pick off unwitting innocents. Jidoor Hall: The largest and most popular of inns and taverns for those non-natives in Tia. Rising five floors and filling nearly an acre of ground space, with a courtyard filled with activity at all hours of the day. A small attache of Problem Solver has been posted around the Hall to maintain peace between all races. Those who can afford it go here for a break from the prejudices of the rest of Tia. Priscilla's: A massive department store, connected to its manufacturer, for home goods and appliances, clothing, perfumes and colognes. Boarded up: Priscilla’s owner, Girdy, is imprisoned in the Black Tower. Riverside Park: The first government created, maintained, and operated park in Terrenus. It is the greenest place inside the walls of Tia, and numerous Dryads and mystical creatures live in this mecca of foliage. A few wonderfully sculpted buildings (such as the gazebo pictured above) also dot the park. Vampires enjoy this area too, so it has remained largely untouched. Steamgear Clan: Gang of trolls known for abducting Tian citizens in the nighttime hours of Tia's poorer districts. Facing ostracization and death if they did not defect to either the huma or vampire side of the Tian conflict, Steamgear has taken up the vampire mantle and serves as a detachment of cronies for the Matton family. The Rooks: A mercenary organization who rose from the ranks of government security officers displaced by the Blastice riots in Tia. There are thousands of members spread in fortified pockets throughout the city, but the Rooks’ loose lower hierarchy prevents an accurate census. Due to this, their fighting skills and specialties range across the board in terms of strength and quality. Two commonality all Rooks have, however, is an unbreakable loyalty to the former Nica administration’s values of human-vampire equality and a trust in X Caliber’s ability to dispel unholy beings such as vampires and others who use evil magic. Tia Rail Station: The Tia Rail Station is in ruin. Creeks and clanks of steel signify a quick end in this gloomy abandonment, as it has become a frequent gathering place of vampire punks and demi-human gangs. General Advocates Office and Justice Courts (GJAC): Once the symbol of law in Tia, the GAJC is now the site of capital punishment for what? Being human. A Dolos vampire satirically dons the garb of a judge while captured humans are brought before him. All are convicted of the crime of humanism, eaten, and carted off site. The Watch Fort: A huge reinforced monolith, the Watch Fort was once the home of the Tian Problem Solvers, the main protectors and enforcers of the law. Now it is a shell of itself, locked down and dark in the windows, which even vampires have failed to breach. What goes on within the former military barracks is a mystery. The Black Tower: This is a tower juxtaposed against the brilliance of the Watch Fort. It is a dark place from which a devilish mage once puppetized most of the city including his clone, Nica Sero. Once the throne from which Cain Rose laughed down on Tia, now the Black Tower is a residence for the Serafino Heretic Dolos, Patriarch of Tia. Serafino Heretic Dolos: Patriarch of Dolos, Matton, and Tian vampires. Embassy (located beneath Watch Fort): There are quarters and offices in the Watch Fort that housed federal agents both on the move and stationed in Tia. Who survives here— if anyone— is a mystery, but whoever it is will have been locked in the recesses of the establishment for months now. Nichole School of Magick: A symbol of amnesty between serving regent Nica Sero and his past political competition with the Nichole family, this fine institution sculpts the youth of Tia wondrously in the art of all magicks and the defense against them, especially healing. Scholars still frequent Nichole School of Magick for its gated fortitude against the vampire hoards who have taken over the city. Gertrude Verdance: Wealthy business owner and investor, owner of Girdy’s Girders and Priscilla’s. Girdy is kept prisoner in the lower levels of the Black Tower. Jackson Crawtervane & Solis Colgan: Partners in crime and leaders of The Bleeders, Jackson and Solis are constantly on the move and hence extremely difficult to track. They can usually be found in one of the Bleeder bases or causing mischief in the poorer parts of Tia, liberating human prisoners from vampires. Jonothon Oaxaki (owa-ha-ki? Symphonic prodigy rising out of the copper-mining district, performs at the Jidoor Hall on Tia's most popular evenings for music patrons, Sundays and Thursdays. Oaxaki is one of the only humans able to live lavishly in Tia. The Dolos clan, largely appreciative of their arts, provide Jon a compound in Northeastern Tia with human security of his choosing should lesser vampires encroach on his protected status. The Black Stripes: Vampiric Terran rock duo Jesse Black and James Black, who made their notability recording garage-style folk rock out of a small home Weland, now reside in the southwestern quadrant of Tia. Their music glorifies the killing of humans as something punky and cool. Dr. Theodore Amantis: Innovative physicist and engineer responsible for the creation of the Fauxton, a transportation technology native to Tia. Nica Sero: Former regent of Tia who surfaced out of the turmoil of the past vampiric regime’s fall. His history is not well known and his family is kept well from public view. He has a crazy relative of some sort who lives in a tower outside of town. This relative was recently exposed to be the puppet master of Nica Sero, Cain Rose. Cain fled with the Problem Solvers, vowing his vengeful return one day. Serafino Heretic Dolos: Vampire Patriarch, acting ruler of Tia. Karalanos (Karl) Matton: Confidante of Serafino Dolos, second-in-command. Brutal vampire who lives off of blood both in physical and emotional terms. May Dolos: Mysterious vampire girl of an unknown race. Harnesses a werewolf-like power but affects others the same as a vampire would. Tia, the pinnacle of mechanical engineering in Terrenus, now seethes with trouble. Between steam technology and the manufacturing of steel, Copper City appeared to be on the rise for the past decade. The state of the city, however, is not all it appears to be. Vampires viewed Tia as a city that was stolen from them. With the expansion of Gaianism, races like them who were less cohesive with its ideals began falling to the wayside. After a slow rise of resistance to their authority, benevolent vampires fell from positions of authority when a drug was introduced into the city’s water supply which drove vampires to bloodlust and deemed them unfit to justly rule Copper City. Since then, the vampires have plotted their revolution. Afterwards, a more human-favoring ruler shifted public opinion against vampires. Humans and other humanoid races now find themselves on one side of a divide of hatred and mistrust between vampires and humans. Humans raid blood banks (voluntary blood donation centers for vampires) and distribute .X Caliber bullets- blessed silver made for killing vampires- for regular arms, sparking a giant mechanical arms race in Tia. Vampires attack humans with a new understanding of, and resistance to, holy magic. Fringe races such as goblins, ogres, and trolls must prove themselves friendly through overt acts of hatred toward vampires or be subject to the same prejudice. Who sits at the top of Tia’s uneven power duality changes with the whims of the wicked wind, but one thing is certain: it is always a fight. Whether the rest of the city likes it or not; elves, trolls, dwarves, and demi-humans of all proportions are dragged into the conflict between the two. Which side one is on tends to be a larger topic of discussion than where one works or what they do for fun. Vampire-on-human attacks in the middle of the street after dark. Human-on-vampire raids into dark buildings and underground passages. Ally yourself with vampire force, further their cause. Ally yourself with human force, further their cause. Find faction leaders, merchant bosses, and noble families and gain leverage. Establish arms trade and/or development with human factions. General attacks on government buildings and blood banks. Figure out what happened to the shop owners. Figure out what happened to Nica Sero. Establish your business ventures in the vacuum created by vampiric revolution. Destruction des morts: The Dead destroys Tia, taking most businesses, seventeen (17) Tia issue Faux-ton receivers, the Rooks, Nica Sero, 50,000 children and nearly 11,000 Problem Solvers to a waylay point near the Haunted Glen to be transported elsewhere. Nichole School of Magick escapes Tia and heads for Aspyn, a beacon of safety in Northwest Terrenus. Feurerkonig is dead and Cain has his head. Lilith goes for the Crown of Asteria. Koji's arm turns into an exploded meat log and he leaves. Serafino Dolos survives with a small horde of his Dolos and Matton vampires, but infected with the malignant Maleficence. The surviving clan adapts to a new taste for blood of both nonvampires and vampires. The blood of a nonvampire is empowering as always, but the blood of a vampire offers new and even higher limits. As such, a new dynamic of subversive paranoia exists among these surviving vampires. Carpe Noctem: Dove is guided to a gathering of vampires planning a strike on a human rally. At the gathering, Karna finds himself allied with human sympathizing mercs called the Rooks. Antique finds herself objectified as an icon of evil, and is saved by a vampire girl who then flies her to the dwelling of Cain Rose. Antique finds Cain has been controlling the city’s leading officials and illegally selling human blood to vampires in order to maintain power. Dove and Heretic confront Cain with mayor Nica taken as prisoner, seeing Tia change ownership and now belong to the vampires and unnaturals once again. The Rooks and several human forces, however, remain strong in the name of the former regime, using and distributing blessed X Caliber weaponry. Traffic Control - The Highway Wicked: Apache and Nasreen beat out a The Highway Wicked Gang in Haunted Glen in order to secure a trade route between Tia and Ponkapoag Lake. Cut Out The Heart: An enchanter (Tegrash) hires a group to travel with him to the Haunted Glen to gather rare spell components. Teg unintentionally starts a riot which his hirelings quell and Teg is banned from Tia. The group still manages to gather the components in the Glen and deliver them to Teg, and are paid with a bag of trinkets before Teg rides off. A True Adventurer Is Heroic! : Mismatched travelers foil a trickster's plot to take over Tia, saving the mayor's nephew. The gears of Steam City have shaken their rust and as it corrodes, her innate industry pulses through renewed veins once more. Factions have been disbanded altogether or relegated through extreme force on behalf of a buffered police force to the umbrella of an anonymous organization. Beneath the hand of Tia's current rule crime is falling, business is up, and morale is blossoming. The Calm: A supernatural calm washes over Tia when mayor Nica Sero brings a sequoia seedling from the Peaceful Woods and plants it in the courtyard garden of his manor; directly in the center of the city. Out With The New: Nica Sero enters Tia and overthrows the Nichole regime after deeming it unfit to rule. The Rightful Lady of Tia: We see the rise of Selena Nichole as the new lord-mayor of Tia, following her establishment as a local baron in Search of a Home. La Belle Peches: The nightclub is destroyed in a perceived terrorist attack, brought to ruin in an explosion of fire. Tia has always born a rustic hue, both in color and culture. This copper giant of industry once focused solely on steam as a manner of energy, aptly gaining its nicknames Steam City and Copper City. The hands that have historically powered this machine are greatly diverse, ranging from humans to elves, dwarvess, gnomes, goblins, hobgoblins, kobolds, minotaurs, dryads, lizardfolk, and ogres. A sliver of this populace was afflicted with vampirism, primarily the noble houses, bringing Tia under vampiric rule for a time. A mysterious organization poisoned Tia’s water supply and drove vampires to bloodlust, calling for the intervention of national security forces to expel them for the better of the city. Nica Sero stepped in, removing the viceroyship and installing a democratic government in which he successfully campaigned against yet another vampire family for rule. Under human leadership Tia turned from its traditional, purist sense of relying on steam magic. Beneath Nica's formation of a committee of engineers and scientists, the city came to focus expressly on educating its inhabitants about magic and technology, further advances in application of steam in the latter. Months ago, a vampiric propagandist machine uncovered the fact that Sero was selling live humans to the vampires in order to sate their bloodlust and maintain peace between vampire and human nobles. A riotous event led to the exposure of Nica Sero as a clone of an evil mage named Cain Rose who did the morally questionable behind-the-scenes work to which Tia owed much of its industrial success and the brunt of its peaceful years. 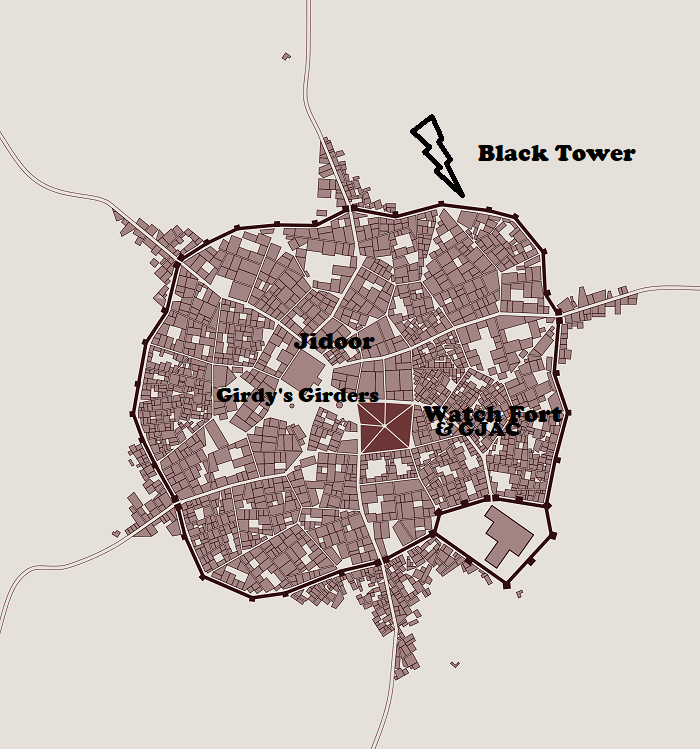 Many of the city's former defenses, the Problem Solvers, ended up being under Rose's control, and fled with him when vampire forces raided the Black Tower where he lived outside of Tia. Serafino Heretic Dolos, eldest of the Dolos clan of vampires, took control of the city with the Matton vampires as his defenders and direct lessers.